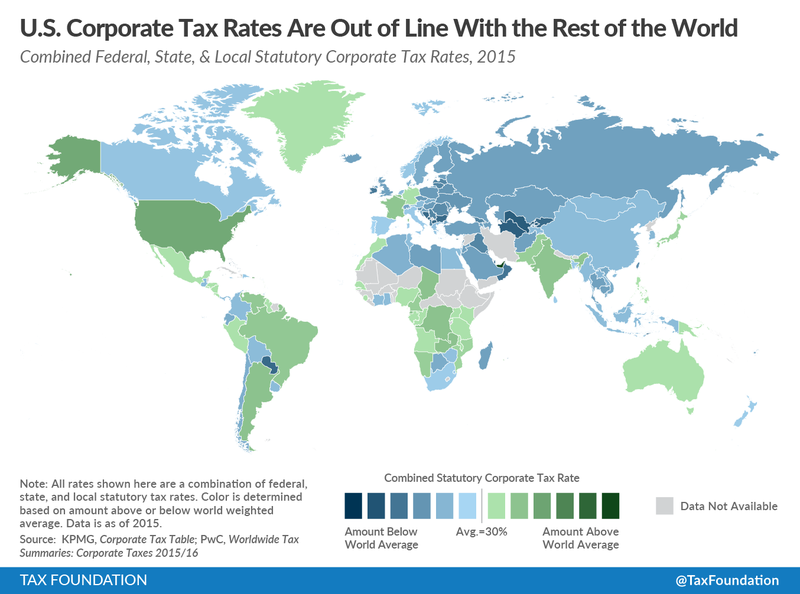 The map shows statutory tax rates for corporate income around the world. These rates include the federal, state, and local taxes where there are multiple levels of government. For example, the United States has the highest corporate income tax rate set at 35 percent at the federal level, but the average tax on corporate income at the state and local levels amounts to an additional 4 percent, which brings the total tax rate to 39 percent. The majority of countries fall below the GDP-weighted worldwide average rate of around 30 percent. Most European countries fall below the worldwide average. Only France and Germany are above the average. Argentina, Brazil, France, India, Venezuela, the United States, and several African countries have corporate tax rates notably greater than the worldwide average. Read Corporate Income Tax Rates around the World, 2016 for a complete list of corporate income tax rates by country.